Our fresh, hearty oysters range in flavor from briny and slightly metallic to cucumber/banana flavors. 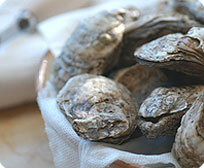 Oysters can be steamed, baked, grilled, broiled, sauteed, fried, or frittered. 20 to 30 oysters per pint.